Kaposi's sarcoma is a cancerous tumor caused by the human herpesvirus 8 (HHV8). KS as it is usually called is also known as Kaposi's sarcoma-associated herpesvirus (KSHV). Kaposi's Sarcoma is named after Hungarian dermatologist Moritz Kaposi who discovered the disease in 1872. The tumors appear bluish-red or as purple bumps on the skin. They first appear in the feet or ankles, thighs, arms, hands, and face. 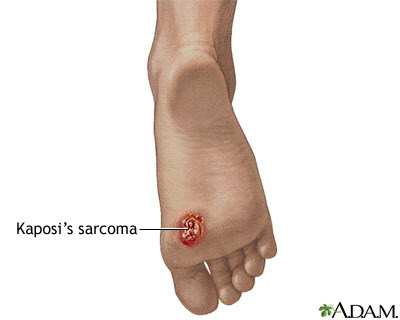 Kaposi's Sarcoma tumors can also manifest in other parts of the body as well. Sometimes, the tumors appear inside the body such as in the lungs, gastrointestinal tract, and other organs. In the 1980's when AIDS first appeared, Kaposi's sarcoma was often associated with it. AIDS related KS is caused by the interaction between the Human immunodeficiency virus (HIV), a weakened immune system, and HHV-8. Treatment of KS in AIDS patients does not affect the chance of survival from AIDS. Unlike other cancers, the cause of Kaposi's Sarcoma has been positively identified. The virus, HHV-8, is transmitted by the exchange of saliva between an infected person and an uninfected one. It can also be acquired through organ transplantation and to a lesser extent, blood transfusion. There is no cure for KS but the disease can be slowed down. Antiviral therapy, chemotherapy, crytherapy (freezing), and radiation therapy are some of the treatments used to managed KS but this does not guarantee that an outbreak of lesions will not happen. A sugar-loving protein drives the growth of Kaposi sarcoma (KS) tumors, according to a study published on October 1st in The Journal of Experimental Medicine. Interfering with these sugary interactions inhibited growth of Kaposi sarcomas in mice, hinting at the potential for new treatment strategies in humans. KS is a cancer that is associated with infection with a herpes virus called HHV-8 and is prevalent in HIV patients. Effective antiretroviral drugs have decreased the incidence of KS, but the cancer eventually progresses in many patients and treatment options are limited. A carbohydrate-binding protein called galectin-1 is released by a variety of tumors and promotes their growth and metastasis. A group of researchers at the University of Buenos Aires in Argentina now finds that blocking galectin-1 in mice bearing established Kaposi sarcomas slowed tumor growth in part by suppressing the formation of blood vessels that feed the tumor. If the same holds true in humans, drugs targeting galectin-1 could provide new treatment options for patients with KS. These drugs might also hold promise for other diseases characterized by aberrant blood vessel growth, including macular degeneration and cardiovascular diseases.